Today was (is) an important day in the steps toward reconciliation in Canada. Today, many people wore orange shirts “in honour of residential school survivors and in memory of those who did not”. This is a huge start in creating awareness of the tragic and horrific years that residential schools were in existence; in addition, it is also a chance to highlight the incredible strength of the thousands of people that survived their residential school experience. 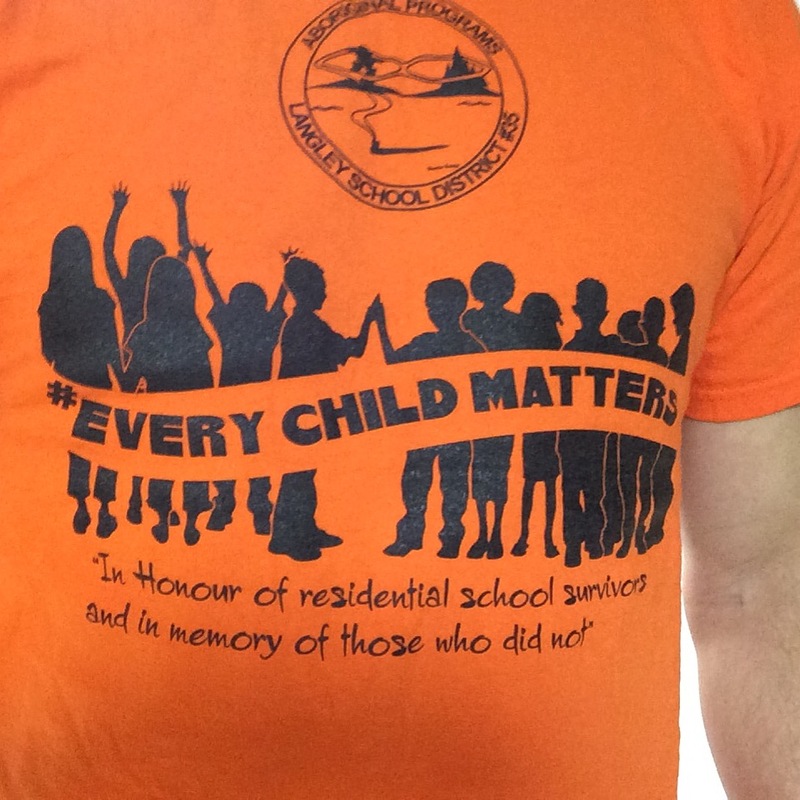 I was proud to look around at so many colleagues in the Langley School District wearing orange today as a way to say that we are committed to reconciliation. Thank you to Michael Morgan along with our leadership team for putting this at the forefront of what we do as educators in Langley. Having said all this… some of my critical friends (who are so passionate about equity) who continually challenge me to be better would say that wearing an orange shirt is easy. It just scratches the surface of building understanding and working toward real reconciliation. As Justice Sinclair shares at the video on the bottom of this post, “We cannot look at quick and easy solutions because there are none” and so the more important question is, “what can we do today to make steps toward reconciliation?”. We did an amazing job of supporting Orange Shirt Day… so what’s next? One of the challenges that I face is the fact that I often do not know the answer to this question. However, I have had the privilege and honour to work with incredible people who have continually challenged and mentored me during my years in the Fraser-Cascade School District (Kasey Chapman, Nancy Pennier, Robert Genaille, Tyrone McNeil along with far too many to name in the communities of Seabird Island and Sts’ailes) as well as people whom I get to work with now in the Langley School District (Cecilia Reekie, Donna Robins (and the Gabriel family), Bonnie VanHatten along with many others). If there is one thing I have learned through the many conversations I have had with these mentors along with many survivors of residential schools is that I just need to listen. I need to listen to the stories. I need to listen for guidance. I need to listen to determine how to support (and work alongside with) those who will lead us to reconciliation as we move down this important path. Orange Shirt Day has led to more questions from educators, students, and families than I have ever encountered in the past and this is such a positive start. The challenge is moving beyond the single day event and making this an important journey toward reconciliation. I feel I have very few answers. I also know that this is ok because I have many people that are leading me and so many others down this path that we must take as an education system and as a society. “Every Child Matters” – every child in our past, present and future matters. Thank you to everyone who has promoted Orange Shirt Day and taught me so much about the tragic experiences of residential schools as well as the incredible strength of those survivors. We must now keep the dialogue and actions going beyond Orange Shirt Day. Connect with those who can lead us on this journey together as a Canadian society. Reconciliation affects all of us. Take the time to simply listen to our neighbours and community members, ask questions, seek to understand, seek guidance, and move forward together. As terribly difficult it is to hear the stories from the survivors of residential schools, it is so moving to see the unbelievable strength in people. I am honoured to to have the opportunity to be even a small part of such an important journey in our country’s history. What Is Reconciliation from TRC – CVR on Vimeo. For some key resources and powerful, yet heartbreaking stories, visit the Indian Residential School Survivors Society and the Truth and Reconciliation Commission of Canada websites. Here are 10 books to read with children to help teach about residential schools.